Although hunting season is over and the holidays have passed, you may want to think twice before packing away your bow. That’s a mistake a lot of bow hunters make; storing their bow until shortly before next fall’s hunting seasons. For bow hunters, year-long practice is essential to success. Archery is all about form and physically making the shot the same way every time. If your form is off it will directly affect the flight of the arrow and even seasoned bow hunters can get a little rusty if they don’t regularly practice. Above: While the bow hunting season might be over, putting away your archery equipment might be a mistake. The most successful bow hunters continue to practice in the off-season and salad shooting can provide the means to stay sharp. NMDGF photo by Mark Madsen. In order to maintain good form, bow hunters have a variety of options. Simply shooting at a bull’s eye or ‘block’ type target on a regular basis can help. Others prefer to shoot at 3D targets to help maintain good shooting form and shot placement. Both methods can be done in the backyard (where legal) or in any open field or empty lot. The problem with just shooting at foam targets is that it can become mundane, boring and expensive. Another method of staying in practice for bow hunting is called roving or stump shooting. Of course having stumps to shoot helps and tree stumps are in short supply in the desert southwest unless you’re fortunate enough to live in or near the mountains. Some of the different arrow tips include a rubber blunt arrow point (left), a bludgeon (center), and a clawed-blunt tip (right). Not only are potential targets plentiful in the desert, but salad shooting allows the bow hunter to practice estimating distances to each target. Yardage estimation is a critical skill for a bow hunter and can make the difference between a successful hunt and a discouraging one. Pick a target, make the shot and then step off the distance or use a range finder to find the actual yardage. Salad shooting, like target shooting, can take place in any open field or lot. Even better, salad shoot in the same area or terrain where you plan on hunting. Practice with the same bow and arrows you plan on hunting with and, if possible, wear the same clothes you use during a hunt. Change out your expensive broadheads for cheap blunts or judos before you go. They are durable and won’t damage the vegetation. 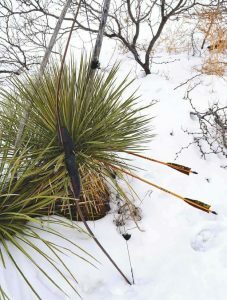 Whether it be a compound, recurve, or longbow, salad shooting allows the bow hunter to practice shots at various yardages and shooting positions depending upon the terrain. Salad shooting will help a bow hunter to work on another necessary skill: spot and stalk. You will find that stalking a prickly pear cactus or yucca is fairly easy; they don’t see well, can’t smell or hear you, and they don’t move very fast. If your miss with your first shot, follow-up shots are normally pretty easy, which will provide an opportunity to perfect those stalking and/or sneaking skills. Experienced bow hunters learn to “pick a spot” when hunting; don’t aim for the entire animal or, in this case, plant. Focus on a small spot on your target and make the shot. And, honest salad shooters always “call the shot” before they shoot. 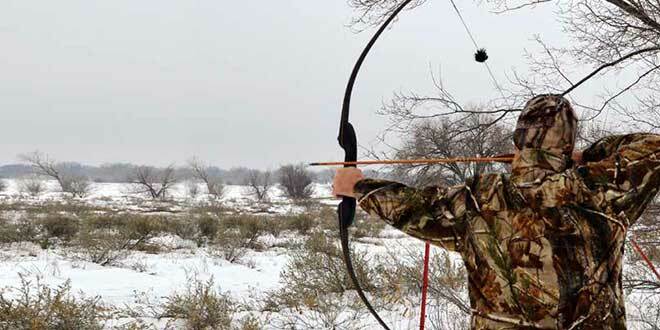 This year, instead of putting away that bow, try roving, stump shooting or salad shooting. You owe it to yourself and the animals you hunt to make every shot count. 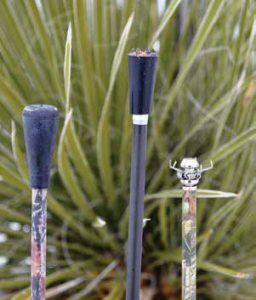 Using one of these tips, bow hunters can “stalk” their prey, which might be prickly pear cactus or yucca. Try to pick a specific spot on the plant and come as close to hitting that mark as possible. NMDGF photos by Mark Madsen. Yearlong practice with your bow could make the difference when that shot of a lifetime presents itself. 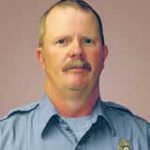 Mark Madsen is the Department of Game and Fish public information officer and conservation officer for the Southeast Area. He can be reached in Albuquerque at (575) 624-6135 or mark.madsen@state.nm.us.